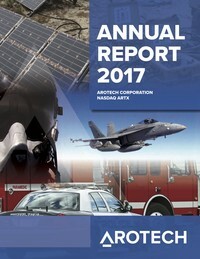 ANN ARBOR, Mich., May 09, 2018 (GLOBE NEWSWIRE) -- Arotech Corporation (Nasdaq:ARTX) today announced financial results for the quarter ended March 31, 2018. Continued its fourth quarter momentum with higher first quarter revenues. In addition, it procured two new weapon simulation software awards worth $3.7 million. Our Israeli operation secured an international award for innovative battery chargers worth approximately $3.0 million for the project’s initial phase. The U.S. operation received supplemental funding of $1.9 million to continue production of Communication Emitter Sensing and Attack Systems (CESAS) for the United States Marine Corps. It also passed an AS9100D audit and achieved a Capability Maturity Model Integration (CMMI) level three appraisal for its product development processes. “Our first quarter results were much more robust than a year ago and reflect the continuation of the solid sales performance we reported in the second half of last year,” commented CEO Dean Krutty. “Our Training and Simulation Division is benefitting from strong commercial sales and consistent program execution for our MILO use of force products and our driving simulators and public safety products. At the same time, our steadily performing weapon simulation group is adding consistent system and software engineering based revenues that provide a growing foundation for this division. “Our Power Systems Division has been investing in new product developments and new sales channels that we believe will further diversify and grow our battery product portfolio. Recent awards validate our efforts to generate sales for these products beyond our base in Israel,” concluded Mr. Krutty. Revenues for the first quarter of 2018 were $27.2 million, compared to $22.3 million for the corresponding period in 2017, an increase of 21.9%. The year-over-year increase was due to higher revenues in both our divisions. Gross profit for the first quarter of 2018 was $7.7 million, or 28.3% of revenues, compared to $6.5 million, or 29.0% of revenues, for the corresponding period in 2017. Operating expenses were $6.7 million, or 24.4% of revenues, in the first quarter of 2018, compared to operating expenses of $6.7 million, or 30.0% of revenues, for the corresponding period in 2017. Operating income for the first quarter was $1.1 million compared to an operating loss of $(227,000) for the corresponding period in 2017. The Company’s net income from operations for the first quarter of 2018 was $596,000, or $0.02 per basic and diluted share, compared to a net loss of $(768,000), or $(0.03) per basic and diluted share, for the corresponding period in 2017. Adjusted Earnings per Share (Adjusted EPS) for the first quarter of 2018 was $0.05, compared to $0.01 for the corresponding period in 2017. Adjusted Earnings Before Interest, Taxes, Depreciation and Amortization (Adjusted EBITDA) for the first quarter of 2018 was $2.2 million, compared to $1.0 million for the corresponding period of 2017. The Company believes that information concerning Adjusted EBITDA and Adjusted EPS enhances overall understanding of the Company’s current financial performance. The Company computes Adjusted EBITDA and Adjusted EPS, which are non-GAAP financial measures, as reflected in the tables below. As of March 31, 2018, the Company had $8.2 million in cash and cash equivalents, as compared to December 31, 2017, when the Company had $5.5 million in cash and cash equivalents. As of March 31, 2018, the Company had total debt of $16.5 million, consisting of $6.2 million in short-term bank debt under the Company’s credit facility and $10.3 million in long-term loans. This is in comparison to December 31, 2017, when the Company had total debt of $15.9 million, consisting of $5.1 million in short-term bank debt under its credit facility and $10.8 million in long-term loans. The Company also had $7.6 million in available, unused bank lines of credit with its primary bank as of March 31, 2018, under a $15.0 million revolving credit facility. The Company maintained its current ratio (current assets/current liabilities) of 2.0 for the comparative periods. As of December 31, 2017, the Company had net operating loss carryforwards for U.S. federal income tax purposes of $40.7 million, which are available to offset future taxable income, if any, expiring in 2021 through 2032. Utilization of U.S. net operating losses is subject to annual limitations due to provisions of the Internal Revenue Code of 1986 and similar state provisions. The annual limitation may result in the expiration of net operating losses before utilization. Arotech had a backlog as of March 31, 2018 of $54.0 million. This compares to a backlog of $52.2 for the same period last year and a backlog of $61.1 as of December 31, 2017. The Company’s 2018 guidance range continues to be: Total revenue of $100 million to $105 million; Adjusted EBITDA of $7.0 million to $8.0 million; and Adjusted EPS of $0.15 to $0.18. The financial guidance provided is as of today and the Company undertakes no obligation to update its estimates in the future. The Company will host a conference call tomorrow, Thursday, May 10, 2018 at 9:00 a.m. Eastern time, to review its financial results and business outlook. The conference call will also be broadcast live as a listen-only webcast on the investor relations section of Arotech’s website at http://www.arotech.com/. The online playback of the conference call will be archived on Arotech’s website for at least 90 days and a telephonic playback of the conference call will also be available by calling 1-877-481-4010 within the U.S. and +1-919-882-2331 internationally. The telephonic playback will be available beginning at 12:00 p.m. Eastern time on Thursday, May 10, 2018, and continue through 9:00 a.m. Eastern time on Thursday, May 17, 2018. The replay passcode is 28485. Arotech Corporation is a defense and security company engaged in two business areas: interactive simulation and mobile power systems. Arotech is incorporated in Delaware, with corporate offices in Ann Arbor, Michigan, and research, development and production subsidiaries in Michigan, South Carolina, and Israel. For more information on Arotech, please visit Arotech’s website at www.arotech.com. Except for the historical information herein, the matters discussed in this news release include forward-looking statements, as defined in the Private Securities Litigation Reform Act of 1995. Forward-looking statements reflect management’s current knowledge, assumptions, judgment and expectations regarding future performance or events. Although management believes that the expectations reflected in such statements are reasonable, readers are cautioned not to place undue reliance on these forward-looking statements, as they are subject to various risks and uncertainties that may cause actual results to vary materially. These risks and uncertainties include, but are not limited to, risks relating to: product and technology development; the uncertainty of the market for Arotech’s products; changing economic conditions; delay, cancellation or non-renewal, in whole or in part, of contracts or of purchase orders (including as a result of budgetary cuts resulting from automatic sequestration under the Budget Control Act of 2011); and other risk factors detailed in Arotech’s most recent Annual Report on Form 10-K for the fiscal year ended December 31, 2017, and other filings with the Securities and Exchange Commission. Arotech assumes no obligation to update the information in this release. Reference to the Company’s website above does not constitute incorporation of any of the information thereon into this press release. * Includes stock compensation expense, one-time transaction expenses and other non-cash expenses.